Porchetta on 110 E. 7th Street near First Ave is named after its main menu item and was opened this past September by an accomplished Italian chef that apparently knows her stuff and chops. 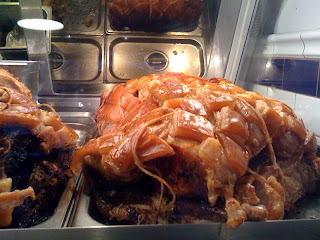 Porchetta is a festival dish that originated in Central Italy and is to Ariccia what Pizza is to New York City. In Italy, it's sold as street food, found in butcher shops in Rome, and is sold out of vans on roadsides in certain parts of Italy. So what the heck is Porchetta? To us it sounded like something fancy we couldn't afford. It's a fatty, gutted, boneless whole hog heavily seasoned and restuffed with some of its innards, rolled up, then spit-roasted over a wooden fire. That's how you would do it traditionally. But since this is Manhattan, the pork is cooked in a fancy steam and dry heat oven that allows the skin to be crisp and the meat to be tender. 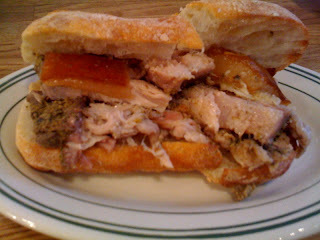 The New York Porchetta specializes in the classic Roman version. Porchetta's pork is from free-rooting whole Hampshire hogs, stuffed with garlic, rosemary, old country wild-fennel pollen, and other herbs and spices. The loins are wrapped in the bellies, then slow-roasted in the oven, and the meat is slowly basted with rendered pork fat. Now this is a sight to be seen. Porchetta's menu is very simple. You're here to eat Porchetta, plain and simple. You can get your Porchetta either as a sandwich on a ciabatta roll ($9) or as a platter with sauteed greens and beans ($14). We went straight for the sandwich. There are no condiments. The juice from the meat will act as your barbeque or ketchup. The meat was tender but because you're eating a sandwich consisting of a lot of fat with crispy skin, it's going to be a bit startling at first if you're not used to eating your meat sandwiches so crackling. Straight to the point - the meat was good. But it was also very very oily. And considering how crispy the skin of the pork was, the meat would have been better served in a bread less hard to bite into. 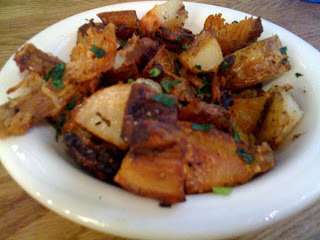 We also ordered the crispy potatoes and burnt ends ($5). A bit salty. We'd probably skip this the next time we're here. We liked the meat (we wouldn't say love). 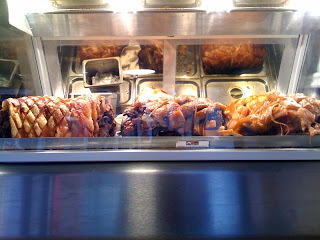 We liked that our sandwich contained meat that took about half a day to cook with careful details in a tiny space. We love that we can get a piece of Italian tradition here. 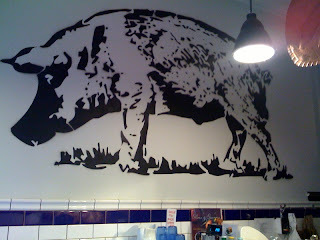 And aside from the food itself, the other draw to Porchetta is Porchetta (the restaurant) itself. The word restaurant is deceptive. The space is small. It has the feel more of a clean food stand/take out counter. But there are a few wooden tables inside and outside of the restaurant (if you're able to catch this place when there isn't a long line out the door). 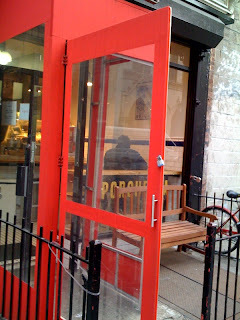 There is a feel of European charm here in the simplicity of its decor and menu. And if you take a sandwich to go, you'll get your meat wrapped up for you in a classic butcher paper. Makes you feel like you've stepped back in time, in a good way. Now only if they can get the prices to go just a bit back in time as well.